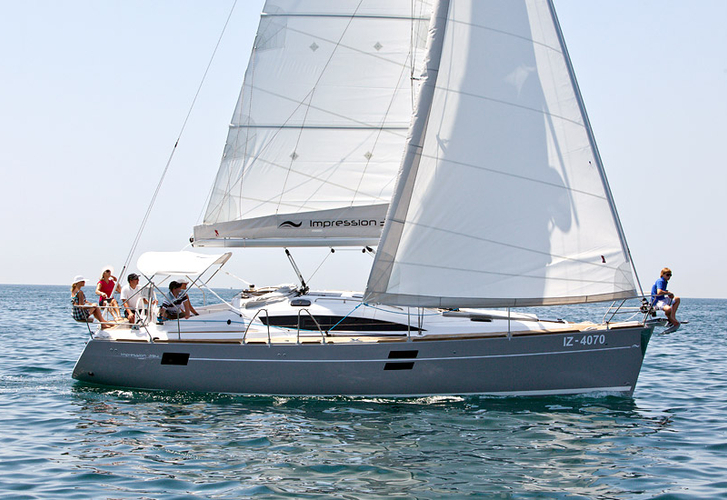 Lena is a name of sailing boat Elan 394 Impression ,which has been built in 2015. You can charter this vessel from harbor Sibenik just a few kilometers from Sibenik. Lena is equipped with 8 berths. Sleeping places on the vessel are arranged in 8 (6+2) scheme. 3 bedrooms are situated inside the vessel Lena. Analyze different boats here: Yacht charter Sibenik. Crew members can feel comfy on this sailboat , because there are 2 toilettes with showers for their disposal. With 165.00 l l. in fuel tank you can sail really far and still be independent because of 240.00 l l. in water tank. Lena is supplied with motor 39 hp. Yacht's dimensions are: LOA - 11.90 meters , width - 3.91 m and 1.80 m of depth. Nonrefundable deposit is at the level of 1500.00 EUR. In our search engine you can quickly check avalailability of yacht Lena from Sibenik by navigating to the section Yacht charter Croatia.